This a great master mix of hot cocoa that you can then split into smaller batches and change the flavor. I added these into my candy gift boxes for my hiker friends, bagged into ready to use portions. All one needs is boiling water, a mug and a spoon to have a rich cup of cocoa on a cold day. Mix the ingredients in a large bowl. Using a mesh strainer, sift it twice into another large bowl. You want it finely powdered, the dry milk will need to be pushed gently with a spoon to break it up. Once it is fully mixed divide it between three small mixing bowls. The first bowl is straight hot cocoa. In the second bowl for Mocha Cocoa add 2 Tablespoons instant espresso powder, stirring to combine. In the third bowl for Spiced Cocoa add 1 tsp ground cardamom, 1 tsp ground cinnamon and 1 tsp ground ginger, stirring to combine. Scoop out 1/4 cup measurements and pack into 8 snack sized zip top bags per flavor (for 24 total). Mark each bag “Add 1 cup boiling water”. Why the salt? I know its not much compared to the total volume. What’s the taste difference if omitted? BTW, thanks for feeding your blog posts into Twitter. 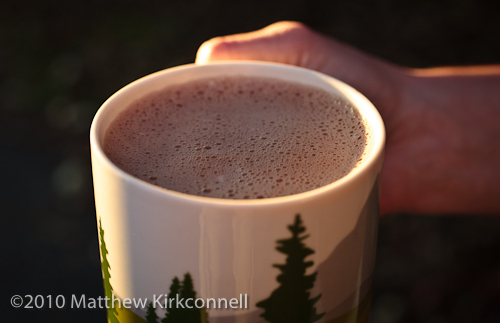 Helps me to keep abreast of your blog and find things like a good hot chocolate recipe. The tiny bit of salt really seems to “pop” the flavor. You don’t need it though! !